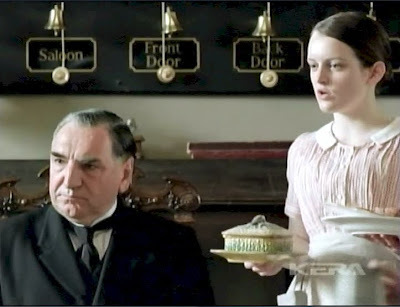 Look what we spotted in the 2012 run of Masterpiece Theater's "Downton Abbey". The year was 1916, and the servants were just at the end of their lunch in the servant's area. Carson was seated and Daisy was cleaning up the table. In her right hand is an English Pineapple Majolica Sardine Dish!